So you want to play Animal Crossing: Pocket Camp, but it’s only available in soft-launch in Australia. Here’s a quick, easy and only slightly shady way to create an iTunes account in another country, straight from your iPhone or iPad. First, go into your phone or tablet’s settings and sign out of your normal iTunes account. Then open up the App Store, find a free game or app, and click on the “Get” button. You’ll be prompted to either use an existing Apple ID or create a new one. You’ll want to create new, of course. You’ll be prompted to enter an email address and choose a password. You’ll need an email address that isn’t associated with an iTunes account. I generally create a new Gmail address when I need to sign in to a new country’s store. The most important part here is selecting the country. Since Animal Crossing: Pocket Camp is available in Australia, we’ll select that. If you wanted to give the excellent Assassins Creed: Rebellion a try, you could sign up for an account in The Philippines. I currently have accounts in Australia, Japan, Canada, The Philippines and New Zealand. You’ll be asked to enter your name and date of birth and set up some security questions. Then comes the billing information, which is where things get a little tricky. Your best bet under “Payment Method” is “None.” If you enter a credit card or PayPal account, it will need to have a billing address in the country of the account you are creating. Selecting “None” allows you to enter any address, as long as it is in the correct country. In this case, I Google Australian hotels and picked the first one that came up. Once this step is complete, all that’s left is email verification. Enter the code sent to your email address, and now you’ve got a semi-functional iTunes account in another country. I say semi-functional, because you will not be able to make in-app purchases in the games you play from other countries—though maybe that’s a blessing. Once the game launches in your actual region you should be able to re-download and spend until your loved ones host an intervention. 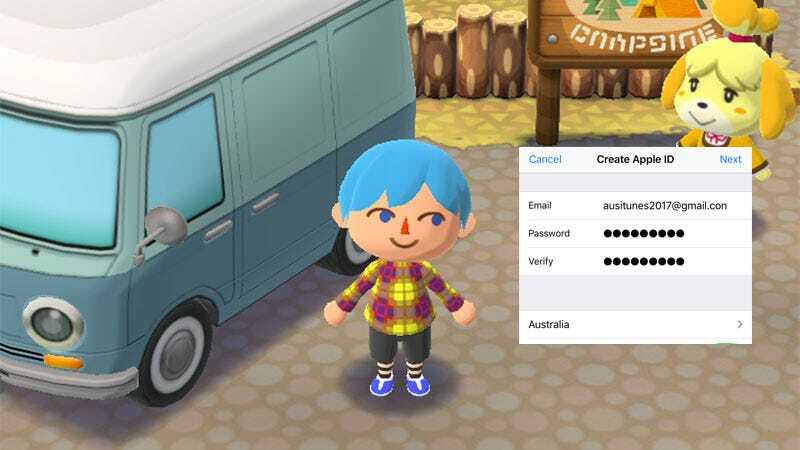 In the case of Animal Crossing: Pocket Camp, it is currently region locked to Australian Nintendo accounts, so you’ll have to play unlinked until the global release in late November. Getting the game early on Android is a bit trickier. Australian players have released an APK file for the game, which can be downloaded and installed (you’ll have to enable installation of apps from third-party sources in settings), but there are risks involved from downloading a free-to-play game from an unofficial source. A fake APK could easily compromise the security of your mobile device.